Since Ebola fever emerged in Central Africa in 1976, a number of studies have been undertaken to investigate its natural history and to characterize its transmission from a hypothetical reservoir host(s) to humans. This research has comprised investigations on a variety of animals and their characterization as intermediate, incidental, amplifying, reservoir, or vector hosts. A viral transmission chain was recently unveiled after a long absence of epidemic Ebola fever. Animal trapping missions were carried out in the Central African rain forest in an area where several epidemics and epizootics had occurred between 2001 and 2005. 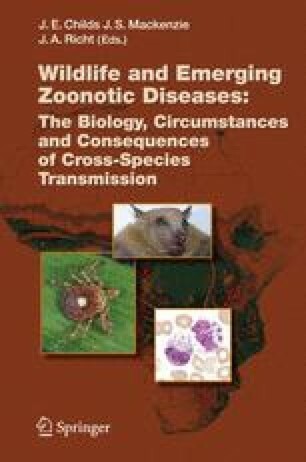 Among the various animals captured and analyzed, three species of fruit bats (suborder Megachiroptera) were found asymptomatically and naturally infected with Ebola virus: Hypsignathus monstrosus (hammer-headed fruit beats), Epomops franqueti (singing fruit bats), and Myonycteris torquata (little collared fruit bats).